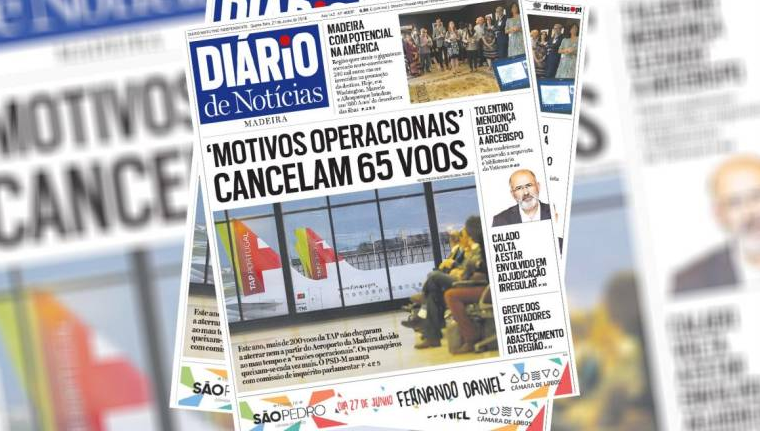 The front page of today’s Diario focuses on the poor performance of the national airline TAP when it comes to delivering flights to Madeira. It has calculated that more than 200 flights failed to take off or land on the island so far this year, including 65 for “operational reasons”. As a result of these cancellations the Regional Government of Madeira yesterday sent a letter to the Portuguese Prime Minister António Costa, and the Minister of Planning and Infrastructures Pedro Marques, protesting over the manner in which TAP has been cancelling flights to and from Madeira Airport, specifically since March. In the letter, the Regional Government requests the intervention of the Government of the Republic, in order to take the measures that the gravity of the situation demands, avoiding the accumulation of large damages to the Madeirans and Porto Santo, as well as to the regional economy. With a slightly different set of statistics, the letter states that these more than 70 of the cancellations in just three months were motivated by “operational reasons” and impacted on 9,500 passengers. The letter recounts that there have been daily reports to the Regional Government of dramatic situations in airports experienced not only by youth groups, students, athletes, but also by numerous families, many of them with children, who did not deserve such treatment from the national flag carrier, and points out that the law expressly provides for these circumstances. A nearly identical report of the official protest appears in the Journal. One of the most popular saints who is celebrated in Madeira is St. Peter. He is the patron of the parishes of Ponta do Pargo, São Pedro in Funchal and has chapels dedicated to him in the parishes of Câmara de Lobos, Porto Moniz (Lamaceiros), Porto Santo, Santa Cruz (Lombada) and São Jorge. However, the biggest celebrations take place in Ribeira Brava. FN note that although the parish of Ribeira Brava officially has St. Benedict as its patron saint, it is São Pedro who motivates the largest party oin the town, and one of the largest in Madeira, which takes place at the end of this week. The occasion is marked by the popular marches involving more than a thousand people, including two groups from the Azores, joined by several other regional ones. These take place at 10:00 p.m. on the 28th, culminating at midnight with a firework display. Facebook page here. Classic Car Rally. Old seafront. It’s not just flights between Portugal and Madeira that get cancelled but other routes too. We are booked to fly from Heathrow to Pico via Lisbon next week, fingers crossed. Some of their excuses are pure bullsh*t! TAP no longer has direct flights to the UK. We used them for many years and the plane was always full so why did they stop? With Monarch going bust we are left with fewer available flights and less competition raising prices and this must have an effect on tourism. If TAP are the national airline they should be supporting Madeira and looking to expand their routes, not cancelling flights on what appears to be the slightest pretext.